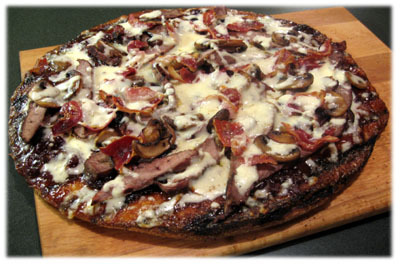 If you love Cheeseburgers and you love Pizza, why not combine them on this unique grilled Cheeseburger Pizza! This recipe uses our Classic homemade tomato sauce to give the pizza lots of body and a robust tomato base that gives this cheeseburger creation a good base to build on. You'll want the seasoned ground beef and lots of cheese but apart from that you can load it up with whatever you normally like on a Cheeseburger. 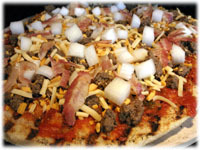 In the picture above we've also added onions and cooked bacon. And, like a typical cheeseburger we even topped it with sliced dill pickles when it came off the grill just before serving. 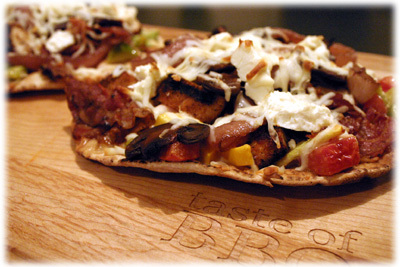 If you want to make your own dough instead of buying premade then we've tell you how to make one with this BBQ Chicken Pizza. This is a great recipe for the kids too. 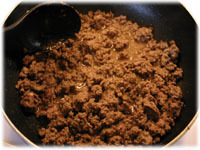 In a large skillet add the ground beef, worchestershire sauce, dry mustard and onion powder. Sautee until browned. Give it a taste and add a little salt & pepper if needed. Oil the insides of a large mixing bowl and place the dough in it. Roll the dough around a bit so it's fully covered in oil. Cover and let rise 2 - 4 hours until doubled in size. 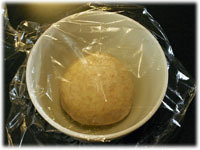 Sprinkle some cornmeal on your counter or working surface so you'll be able to roll out the risen dough. 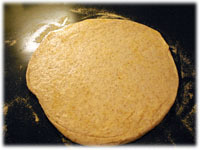 Place the dough on the cornmeal and flip it over to cover in cornmeal. Roll it out uniformly just so it's slightly smaller in diameter than your pizza stone. Preheat the BBQ to 500F and set up for direct heat cooking. 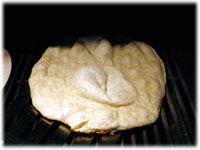 When the grill's reached this temperature lay the flattened dough on the grill and close the lid for 1 minute. 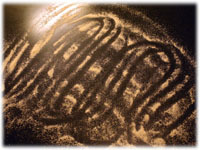 After 1 minute lift the lid and with the corner of your spatula poke any bubbles that have formed. Close the lid for 1 minute longer. 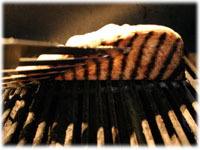 Lift the lid and remove the crust from the grill. 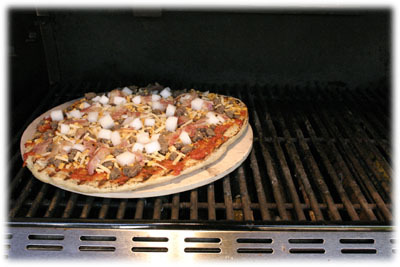 Place a pizza stone (larger than the pizza crust) onto the grill to warm up while you prepare the pizza toppings. 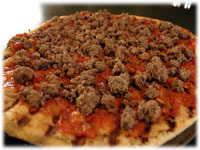 Spread the tomato sauce on the cooked side of the crust and top with the ground beef. Add the shredded cheese, bacon and chopped onion. Note, if you don't want your onion crunchy then sautee it ahead of time until softened. Add any other typical cheeseburger ingredients you'd like too. 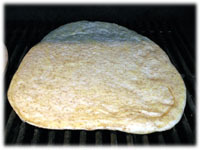 Sprinkle the pizza stone with a little corn meal and slide the pizza onto the hot stone and close the lid for 3 minutes. After 3 minutes, check it to see that the cheese is melted and the bottom isn't burning. Leave a little longer if needed. 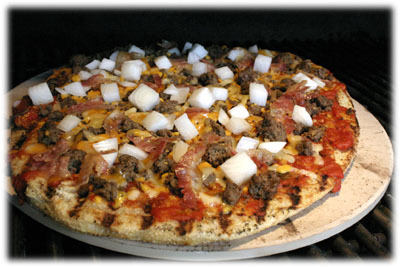 When it's done, remove the cheeseburger pizza from the grill, slice and serve immediately. Don't forget the dill pickles!